For a packrafter carrying a 50+ lb pack, the exclamation that “we are at a river!” is welcome news. We received that news this afternoon as we arrived at the confluence of Camp Creek with the imminently packraftable Danaher Creek. We have trekked about 16 miles from Benchmark to our camp here. 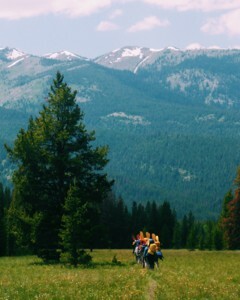 Yesterday, after a ranch breakfast of French toast and sausage, we began an 11+ hour march over the snowyContinental Divide and through downfall not yet cleared by Uncle Sam to a serene camp in a little meadow near Basin Creek full of of Mariposa lilies at the edge of a forest of pine and grand fir. We ended the day with a traditional dinner enjoyed by Rocky Mountain packrafters: fire-roasted sausages. Our crew is in good condition in spite of minor ailments: one swollen ankle, a strained groin muscle, one blister, and a (so far) incidence of the Big D. I have also been battling a cold for the last several days and was not enthused to start the trip with a malady. A few days ago it was accompanied by a low fever and chest congestion. Yesterday’s march was thus something less than pleasant for me and ended with me sleeping (save for a dinner break and helping our crew hang more than 200 pounds of food to protect it from bearthievery). Thankfully, the fever broke last night and I woke up a new man. Although not 100%, my excitement for wilderness travel has increased dramatically. This morning we woke up to the sound of “Bob Marshall Howler Monkeys” – the gigantic pileated woodpeckers – jackhammers of the forest. It was quite a treat to see them live. A 10-hour sleep, relaxing morning, and easy hike was a welcome reprieve from yesterday’s march. This afternoon was spent napping, relaxing, and tenkara fly fishing for Danaher Creek’s hungry cutthroat. The cold front has been replaced by an enormously pleasant high pressure system that has graces us with sunny skies, warm temperatures, and rapidly dropping river flows. The afternoon flows on the South Fork of the Flathead have dropped from more than 9,000 cfs to less than 7,800 cfs in the past 48 hours. That of course bodes well for us. With early season conditions (cold water and high flows), the record high temperatures expected tomorrow will be a pure gift as we get in our boats tomorrow. Danaher Creek is flowing high and we are expecting some new wood in the creek after this year’s high runoff. We plan to pick our way down slowly and carefully tomorrow, and we hope to make it to The confluence of Danaher with Young’s creek and the beginning of the mighty South Fork of the Flathead River, a.k.a. Wilderness Packrafting Nirvana. PS: Thank you @bigskysteph for the Wx and CFS updates! @bigskychase is pretty proud that his mom can read USGS water tables. PSS: Lots ursa sign but no encounters with live fuzz yet.